How much does my company need to raise? In my experience, less than you think. Startups tend to look in all the wrong directions to establish how much capital they need to take in, instead of actually looking at what they need in order to accomplish a clearly defined mission, which is what really matters. In this post, I want to touch upon some of the main fallacies I experience when talking to startups and give you a simple process to establish what you actually need and what would be best to have and how to get closer to the latter. How much have my competitors raised? How much is an average xyz-round? How much could we imagine spending in the next 18 months? Let’s set our goal a bit higher than what we actually need, that way, if we don’t raise the full amount, we’ll still be okay. This is an understandable logic, but completely misguided nonetheless. If you come to an intelligent investor with bloated budgets, she will see straight through it, interpreting it as either–in the best case–incompetence, and–in the worst–as you trying to scam out money of your investors. Make a very, very thought-through and thorough plan for your company defining which goals you need to achieve. Make a realistic budget for how much resources and time you will need as a minimum to attain those goals. Make a realistic budget of what you could do with extra resources in the same amount of time as in the budget above. Show this to everyone who can challenge it. Step 1: The detailed plan of goals is the most important part of your pitch-deck. You have to make the investor agree to these goals as being what your business needs to accomplish. The goals you set here, are essentially what you will be building your next round upon. 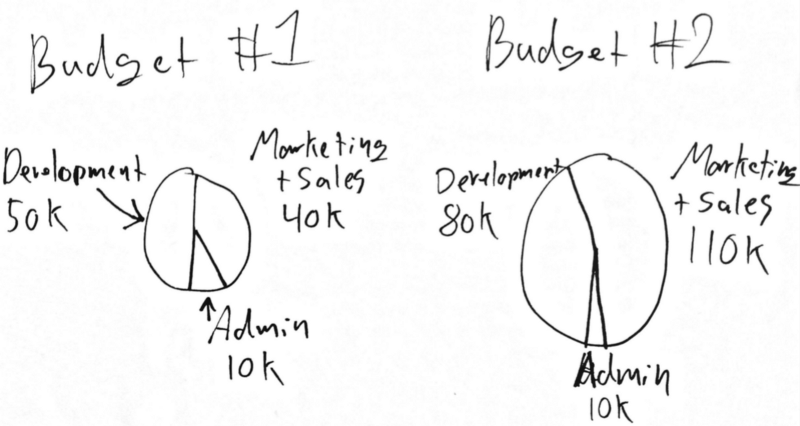 You need to make your goals realistic and attainable, but at the same time, they have to accomplish achievements that will be strong selling-points in the next rounds you raise, or even make you cash-flow positive.Step 2: The sum of the first budget is the minimum amount you need to raise to achieve these goals. This is your funding goal, and you should be honest with investors, saying that this is the minimum amount that will make it possible to reach your goal, and that you are not going to close a round of anything less than that amount. Step 2: The sum of the first budget is the minimum amount you need to raise to achieve these goals. This is your funding goal, and you should be honest with investors, saying that this is the minimum amount that will make it possible to reach your goal, and that you are not going to close a round of anything less than that amount. If it is impossible for you to raise this amount, it’s back to your day job. You have correctly defined what you need to accomplish your mission, anything less than that will waste your time, and your investors money.This is not saying that you need to give up on your business, but either the timing or your plan is off, and you need time to find a new approach. This is not saying that you need to give up on your business, but either the timing or your plan is off, and you need time to find a new approach.Step 3: The second budget addresses everything that will help your business get further, faster. This extra money is not to extend your runway, it’s to get your company further on the runway you’ve decided you need. If you decided in the first budget that you need 18 months to accomplish your goals, you should still budget to burn this extra cash in 18 months. Step 3: The second budget addresses everything that will help your business get further, faster. This extra money is not to extend your runway, it’s to get your company further on the runway you’ve decided you need. If you decided in the first budget that you need 18 months to accomplish your goals, you should still budget to burn this extra cash in 18 months.What you will add, is awesome stuff that will accelerate your growth, make your product better, and motivate your team to work better. The valuation must be the same, and as an early stage company, you are always selling your equity more expensive now than in the next round, so don’t overdo the “wish”-budget. What you will add, is awesome stuff that will accelerate your growth, make your product better, and motivate your team to work better. The valuation must be the same, and as an early stage company, you are always selling your equity more expensive now than in the next round, so don’t overdo the “wish”-budget. On top, it appears strange to investors if you are looking to raise between 100k and 300k. Don’t let the two budget vary by more than a factor of 2. Step 4: Get as much feedback as you possibly can on all of the above. Do you really need that much to handle administration? Can you really build the product you need for that little? What will you eat? Repeat steps 1 through 3 as many times as needed, until you’re bulletproof to questions about what you need and for what.Now you’re ready to fundraise. Now you’re ready to fundraise. Getting what you want, not just what you need. When presenting this to investors, there will be no doubt about the need to fund budget #1. Be honest, without this money, there’s no reason to invest at all. If they challenge any of the figures, show them the detailed budget, and explain the logic behind every single line on it. If you’ve done your work and gotten enough feedback before talking to investors, there shouldn’t really be much to challenge once you start showing the specifics. Now to the good part. If the investor accepts budget #1 and is willing to invest, you show her budget #2. This is the budget with all the awesome stuff on it. Instead of building a scraped MVP that will do what it has to, you show what amazing growth-generating features you will add. Instead of a bare minimum of marketing and sales, you can scale up and accomplish even more in the same amount of time. Instead of 10% of her investment going towards administration, it is only 5%, while revenue generating activities will take up a larger share. Using this strategy, you are securing what you need, but making it likely to also get what you want. There’s no guarantee that you will get what you want, but at the very least, you’ll get what you need. I hear a lot of people–especially VCs–say, that if someone offers to invest in your company, you should pretty much always take it. A lot of the time, that is true. Access to capital is sparse, especially in Europe, and if someone wants to invest, a large amount in your company, it will mean that you can achieve bigger goals, faster. A full [funding]-wallet is like a full bladder; you may have the urge to pee it away. I’m very happy to discuss the opinions in this piece, which are my own and do not express the opinions of my employer. Leave a comment, or tweet at @madsemiil. Background: I’ve been through several successful as well as failed fundraising campaigns in my own companies, and on the sideline of many more. I handle marketing at Funderbeam.com, a platform for making and trading startup investments.